Lebanon's prime minister promised Sunday to hold accountable those responsible for using excessive force against protesters, and hinted at the possibility of a decision later this week to step down from his post following a second day of demonstrations against the government turned violent. The protests Sunday in Beirut began peacefully with thousands of people continuing to express their anger about trash that piled up around the country and broader frustrations about the political system that has failed for more than a year to install a new president. But clashes began in the evening with security forces using water cannons and tear gas to disperse the crowds, some of whom threw rocks and bottles at officers and tried to tear down security barriers. Protest organizers sought to distance themselves from the violence, saying they moved their demonstrations to another area and were not a part of the violence. 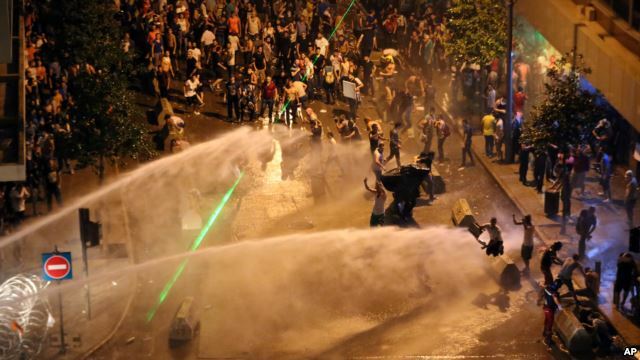 Officials said Sunday's clashes injured 43 protesters and 30 police officers. Prime Minister Tammam Salam said his Cabinet will meet Thursday to try to work out solutions, but that if the talks are not productive, "then there is no need for the council of ministers." The piles of trash were largely removed from sight in the capital in recent weeks, but anger grew when it emerged that much of the trash was simply being dumped elsewhere in the country. The protesters, who also rallied on Saturday in Beirut, have gathered under a campaign titled "You Stink" that expresses both the acute anger at the trash problems and their broader views of the government. A resignation by Salam would further complicate the political situation in a country that has not had a president since Michel Suleiman's term expired in May 2014. The parliament is in charge of picking his successor, but lawmakers have failed more than two dozen times to agree on who should take the post.